With many years of experience selling and installing new garage doors, we know quality when we see it. When customers ask us which garage door company is the best, we don’t hesitate to recommend Garaga. Their doors, manufactured in Canada, are the safest and most reliable. They are strong, tough and energy efficient. You won’t find a better built door elsewhere! We continue to sell and install new Garaga doors throughout the Trumbull County, including Cortland, Warren, West Farmington and Trumbull County. If you’re thinking of changing your garage door, call us today at 330-889-0062 for more information. What advantages does a GARAGA garage door offer? Garaga doors are durable. All doors are built with the best possible materials. 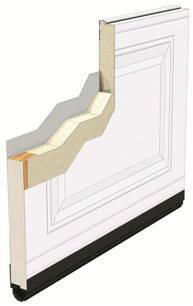 Their panels are lightweight yet strong, and offer up to twice the thermal resistance factor of other doors. Their doors offer high R‑value. Speaking of thermal resistance, GARAGA garage doors offer the highest R‑value to be had. Complete with weather‑stripping, pressure-injected polyurethane foam and air-tight joints, these doors keep the cold and the snow out in winter, and the heat and humidity out in summer. They have a strict production standardization system. All GARAGA garage doors are manufactured following a strict process, which means every door is properly built and inspected. Garaga provides the best warranties. When it comes to your residential garage door, Garaga offers a limited lifetime warranty. It covers many issues such as rust, paint finish and door panels. They have a wide variety of products. GARAGA garage doors come in many available colors and finishes. And with their numerous model, window and hardware options, you’re bound to find the perfect door for your home. Garaga manufactures a wide variety of residential, commercial and industrial garage doors. They have made it their mission to build and distribute quality products. That’s why each door comes with a warranty – you don’t have to worry about quality with Garaga! When you’re ready for your next renovation or new construction project, come and see us to learn what Garaga has to offer. At Midway Garage Doors, we are proudly family-owned and operated. Garaga understands this pride, as they are also a family business. Since 1983, Garaga has been building garage doors in Canada. With production plants in St-Georges, Quebec and Barrie, Ontario, all of their doors are still Canadian-made, and their business family-run. With their quality products, we feel good recommending GARAGA garage doors. Our technicians at Midway Garage Doors have been trained as Garaga Expert, giving you the peace of mind that your next garage door will be correctly and safely installed.